It’s hard to believe that Shopkins haven’t been around forever, such is the speed in which they have taken the children of today by storm. 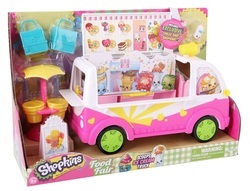 With the Scoops Ice Cream Truck, you get the ice cream truck PLUS two exclusive Shopkins (Wally Water and Kylie Cone), an umbrella stand, a pop up roof revealing the ice cream selection and two exclusive shopping bags! ​For those who have never heard of Shopkins before, this might not look like much, but for Shopkins fans, the Scoops Ice Cream Truck is a must have! Is the Shopkins Scoops Ice Cream Truck Worth Buying? The Shopkins Scoops Ice Cream Truck is a nice playset. The two exclusive Shopkins included are extremely welcome; as with any playset of this kind, you are always left wanting more included! As a toy, the ice cream truck is very nicely made. This is a simple push along toy, which is in keeping with the Shopkins style. The detail on the van itself is impressive, with a sink and faucet inside the truck adding realism. The roof of the truck opens up to reveal a menu for shoppers to choose from, which again is a nice touch. The ice cream truck lends itself to imaginative play, and it’s good to see Shopkins recognising that and adding in relevant functionality. In some ways, it’s refreshing to see a simple mechanical toy that doesn’t light up or play several loud songs any time the wheels move. Those kinds of toys have their place, but that level of interactivity simply isn’t required here; Shopkins mad kids are fully engaged with anything Shopkins related regardless of function! One added bonus of the ice cream truck is that it also can act as a mini Shopkins storage unit when not in use – the truck has room! Overall, if your child isn’t interested in Shopkins, then this isn’t the toy for you. If they are, it’s a cute and affordable addition to any collection.